Girls 13U Black Nightmares Win Gold! 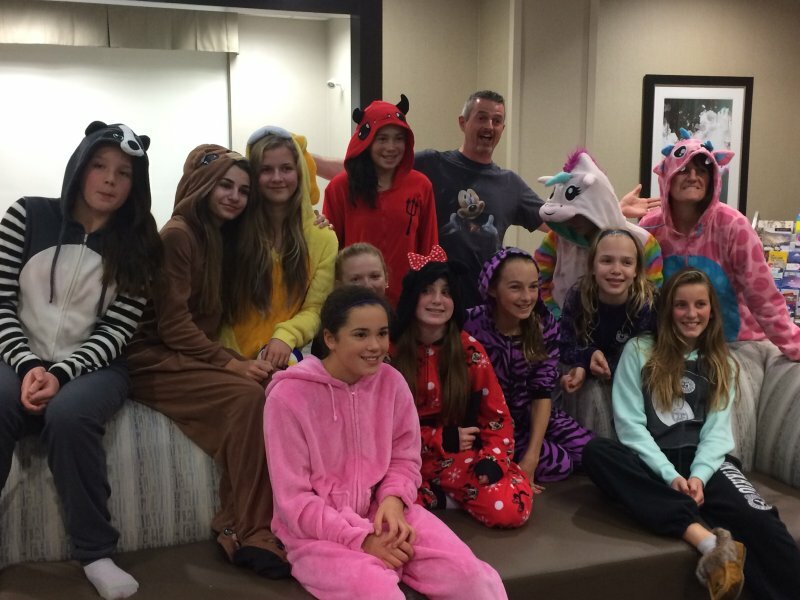 After kicking off the season on November 21st in an age-up 14U tournament, the Durham Attack Girls 13U Black Nightmares travelled to Ottawa a week later all warmed up and ready to play. 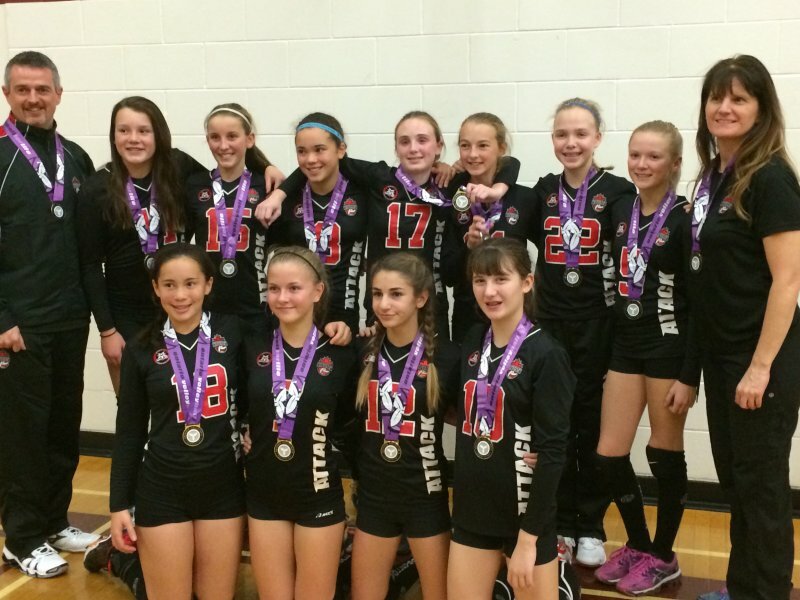 The tournament was hosted by Ottawa Fusion with 9 teams competing in the standard 13U triple ball format. With a mix of returning and new players, the trip provided a great bonding opportunity for the athletes, coaches and families. After a Friday night team dinner and onesie pajama party, the Black Nightmares took the court Saturday morning with a fierceness resembling their name. The girls went undefeated in pool play overpowering the Maverick Sidewinders (25-9, 25-16) and Pegasus (25-9, 29-11). Our lunch break was followed with a bye and the team used the time to refuel and review a chapter in their mental training workbooks, putting some thought into long term athletic goals. In our first crossover game we faced the Ottawa Mavericks and it was quickly apparent what the team’s short term goal was – TO WIN! The 25-19 and 25-16 scores moved us into the semi-finals along with the other two DA Girls 13U teams, Flares and Thunder, and Evolution Volleyball Club from Pickering; it was a battle of Durham Region! The Black Nightmares secured their spot in the finals beating Evolution 25-16 and 25-14 and with the two Red DA teams playing in the other semi-final game, we knew we’d be playing one of our sister teams in the Gold medal game. In the DA Red versus Red semi-final game, the Flares came out on top in a competitive match against the Thunder who went on to beat Evolution for the Bronze medal. The final match proved highly entertaining with aggressive play by both teams. Ending the day undefeated, Durham Attack 13U Black Nightmares captured GOLD beating DA Red Flares in straight games. Being new to Durham Attack, I’m not sure if it is a common occurrence to have the same club win Gold, Silver and Bronze, but the vibe in the gym that day was exhilarating and we captured the moment with a DA Girl 13U Club picture. Congratulation to all three Durham Attack teams – way to represent! Consisting of talented players, dedicated coaches and supportive parents, the DA Girls 13U Black Nightmares have a very promising and exciting season ahead of them. Next up, a 14U Tournament on December 19th at Havergal College in Toronto; this is a Nightmare you won’t want to miss!